Public transport in Rome is always a delicate topic, since it is still violently car dominated and the traffic system is organized accordingly. Public transport primarily consists of buses and attempts to improve the situation are stagnating. And nonetheless, if you want to really get to know a city, at least as far as I’m concerned, living the “public transport-experience” is mandatory. And a ride on the Giardinetti line, or the “trenino” as many Romans call it, is definitely the occasion to get to know Rome as it is, without make-up. 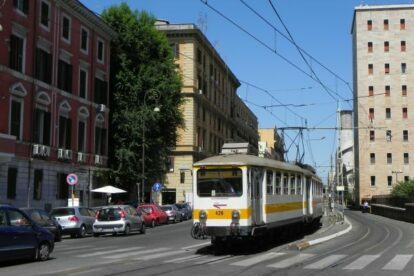 The Giardinetti is a small train that connects the Termini station with the Centocelle neighbourhood in the eastern outskirts, all that with the oldest train sets in Europe still in use, from 1926. Throughout its journey it passes through some of the most populous and interesting quarters in Rome. After leaving close to Termini it soon passes directly under Porta Maggiore, an ancient Roman gate. Later it crosses the upcoming Pigneto neighborhood, where you definitely want to get off and take a look around (and enjoy the many other spots in this area!). A few stops later you will get to “Torpignattara”, doubtlessly one of my favorite zones in Rome. Being also quite densely populated, this multi-ethnic neighborhood is about as colorful, vivid and chaotic as Rome gets. But just looking out the window at houses passing by while observing all the different people and scenes on the Giardinetti is an almost touching, and most certainly authentic experience to me.